With one race already in the books for the Granite State Pro Stock Series (GSPSS), competitors are preparing for a date with Monadnock Speedway May 24. The ¼ mile bullring is located in Winchester, NH, and has been host to four events in the early life of the GSPSS, and creates tight, door-to-door battles and good, hard racing. Drivers like Barry Gray and Matt Frahm are no stranger to this speedway, as both have picked up wins in the series at this facility. The third driver to pick up a victory at Monadnock in the GSPSS is Mike O’Sullivan. 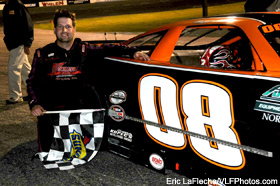 O’Sullivan, the 2013 series champion, already has put another trophy on the mantel this season, grabbing the checkers at Thompson Speedway Motorsports Park on April 6. O’Sullivan will be scaling back his racing duties in 2014, however, as the birth of his third son last month has taken priority. Other drivers filing early entries include youngsters Derek Griffith and Brad Babb, Cory Roberts, Mike Parks, and Fran Colson. Mike O'Sullivan visited victory lane at Monadnock on his way to winning the 2013 GSPSS championship.